Welcome to “This Week in Sustainable Transitions” or TWIST, a shorter blogpost which covers one topic in the news involving sustainable transitions and climate change. So last week was the Fridays For Future protest. 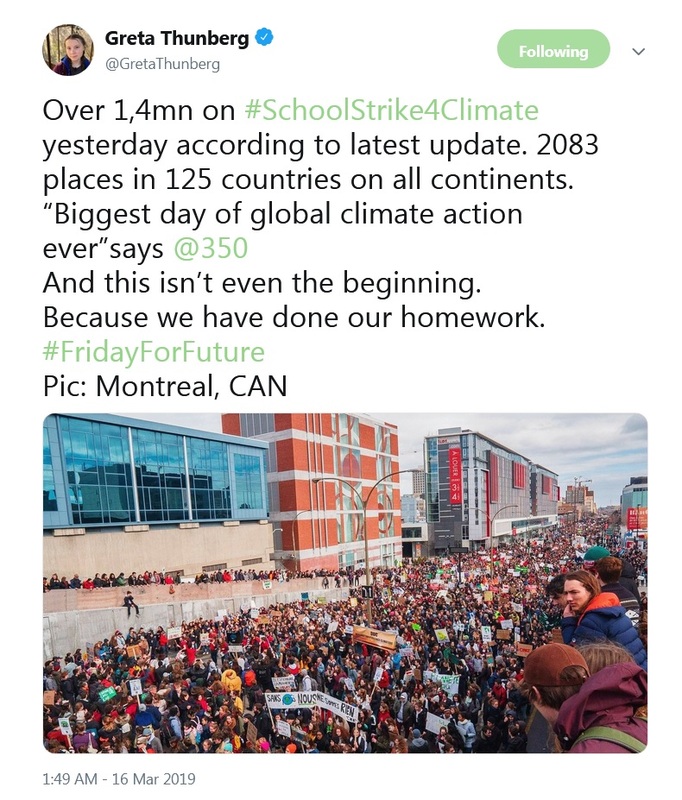 This protest which started by Swedish student Greta Thunberg and encourages students to skip school on Fridays to protest the lack of action on climate change. Friday March 15th 2019 was to be the largest of the Friday protests yet. I was lucky enough to be able to attend the Frankfurt am Main protest. The weather was terrible, a biting combination of rainy and cold, but spirits were high as students began to gather. Excited students flooded out of the ubahn (subway) rushing to their friends while parents and other older protesters looked on. Along with the signs made by the students there were also a number of adult supports including “Parents for Future” and “Scientists for Future”. Over 23,000 scientists in Germany, Austria, and Switzerland signed a petition in support of the student protestors after the head of the FDP (a libertarian party) Lindner said that students should leave it to the professionals. Unsurprisingly, there were a number of students holding signs with anti-Lindner and FDP slogans. The protest passed some of the largest sites in downtown Frankfurt, walking through the westend to the Old Opera where a moment of silence was held. The protest then proceeded to Eschenheimer Turm and then passed through Hauptwache where Friday shoppers stopped to stare at the protestors. The protest ended at the Römer or the square in front of Frankfurt city hall. The current estimate is that over 1.4 million people participated in the Fridays for Future protests worldwide in 2083 locations and 125 countries. The question is now where does this student movement go from here?